Large, traditional houses are still the most popular with Americans,but “tiny homes” have found a niche. In fact, the small homeconcept is creating excitement and buzz among some of the mostpowerful home-buying demographics. For many Millennials and recent retirees – two groups experts say will have atremendous impact on the future real estate market – these modest-sized abodes,typically measuring less than 1,400 square feet, are just right for their needs. Both of these buyer groups are concerned about cost, which is a big part of whatmakes a smaller, more affordable home so attractive. Like many first-time homebuyers,it’s difficult for Millennials to pull together a large down payment, especially withcollege loans yet to be paid off. Recent retirees are typically downsizing into smallerhomes, so while the down payment may not be a problem, living on a fixed incomemakes them very cost-conscious. A small home lacks the interior and exterior space of a traditional home, but that alsomeans there’s less to maintain. Most retirees are tired of spending all weekend tending to a big house and yard, and Millennials lead such busy lives that there just isn’t much time for home maintenance. Another bonus of less square footage: lower heating and cooling bills. Helping to fuel the small-home trend is the fact that many urbanneighborhoods today are woefully short of traditional, full-size propertylots – meaning if home builders want to build, they need to constructsmaller homes on smaller lots. Fortunately, those are considered prime locations for small-home buyers.Both Millennials and retirees want to be within walking distance of friends,restaurants, events, entertainment, and easy access to robust publictransportation. 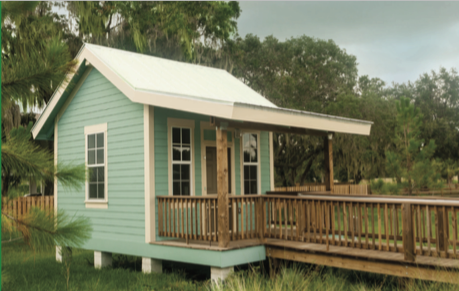 For retirees and Millennials, small homes are also a reflection of their values. Both of these groups tend to have a strong interest in conserving resources, living simply, buying less, and staying humble – all traits that dovetail nicely with small-home living. As these two home-buying groups grow in size, experts predict the small-home trend will only increase in popularity. As for retirees, more than a quarter-million Americans turn 65 years of ageeach month. If even half of those people choose to buy a small home, theimpact on the real estate market will be dramatic. If you or someone you know may be interested in learning more about thisor other real estate burgeoning trends, please don’t hesitate to reach out.